Additionally, certain BFA trainer battles now reward significantly less pet experience upon completion. This is likely working as intended due to some encounters being available at all times and repeatable for the Family Battler achievement. That latest content patch adds 42 new pets! Most of these pets are Bind On Pick Up but can be caged. Note that a few pets will not be available day one of the patch, but should be obtainable in the near future. Check out all 42 new pets! A notable change was made to the existing Island Expedition pets — they can now all be caged! What perfect timing to spread some holiday cheer and gift a fellow collector an extra Island Expedition pet or two. Unlike the Wailing Caverns and Deadmines Pet Battle Dungeons, the only prerequisite for Normal Gnomeregan Pet Battle Dungeon is All Growns Up! After you've earned this achievement you can speak with Radek Fuselock (inside Happy Haloaua's residence in Dazar’alor) or Tizzy Gearjolt (outside of Dana Pull's store in Boralus) to pick up the breadcrumb quest to start your adventure. Speaking of Wailing Caverns and Deadmines...both have been updated and only require the All Growns Up! achievement, and all three Normal Pet Dungeons can now be completed in any order. The Challenge version of these dungeons still requires at least 15 max level battle pets, and the completion of the Normal version first. The Gnomeregan Pet Battle Dungeon includes 9 stages, with a total of 12 different Pet Battle encounters. Enemy pets include max level Mechanical, Elemental, Critter, and Undead pet types, ranging from rare quality to epic. Completing the Pet Dungeon will award an Ultimate Battle-Training Stone, plus the ability to teleport directly to Micro Zoox by speaking to Manapoof in Boralus or Dazar'alor. It also unlocks the weekly quest, Pet Battle Challenge: Gnomeregan, which is necessary to earn the achievement of the same name. Complete this achievement and earn yourself a nifty new Mini Spider Tank pet (pictured right)! Micro Zoox, the vendor located outside of the Gnomeregan portal, has new items for sale that may interest pet collectors. A new currency, Pristine Gizmos, is earned by completing the account-wide weekly challenge version of the Pet Dungeon, and can be traded to Micro Zoox for new pets, an engineering schematic to craft a new pet, or an Unopened Gnomeregan Supply Box. Gather up your best pets to match up against some malfunctioning miscreants in this newest Pet Battle Dungeon — Gnomeregan won't clean itself up! The "Family..." series is back for another round! This time Family Battler challenges players to defeat Battle For Azeroth master trainers with teams composed of max level pets of all one family. Best 15 out of possible 19 trainers in this way, and for each pet family, to earn yourself the Wicker Wraith pet. NPC trainers that are part of this achievement can be battled at any time, even if their associated World Quest is not active. What better way to show off your new spooky pet than atop the Cranky Crab? This is a fun toy from the new Island Expedition Dubloon vendor that allows a battle pet to ride on top of it. The toy costs 200 Dubloons. 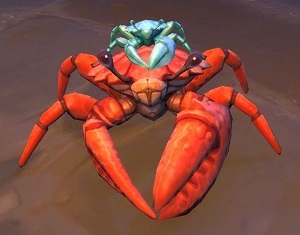 But if you can't wait for the Wicker Wraith, why not try a crab...on top of a crab! With all of these new pets, your Pet Journal might be starting to feel a little full. A new addition to the BFA pet vendors that might help is the Interdimensional Pet Portal. Using this item will increase the maximum number of pets allowed in your Pet Journal to 2000. It costs 1000 Polished Pet Charms and requires having already learned the Pocket Pet Portal. Pet Battle PVP can be a daunting experience, especially for newer battlers. However, an update to the matchmaking system now makes it more likely for newer battlers to be matched against other newer battlers. It's unclear what factors determine whether or not a player is 'new' to Pet Battle PVP gameplay, but we hope this will help make this aspect of Pet Battles less intimidating and more accessible for all battlers. Last but not least, there's an intriguing note in the official 8.1 Patch Notes, under the 'War Campaign' section. We aren't entirely sure what will be required to unlock vendors of the opposite faction, or how long it will take. But we look forward to discovering more of BFA's story and experiencing the perks that come along with it. Which pet are you looking forward to collect first in Patch 8.1? Collector or battler, we hope you're as excited as we are to dig into Tides of Vengeance Pet Battle content! Please join us in welcoming our new graphic art volunteers, Woweonarpets and Zanzuderidu! These talented artists provided significant assistance during our preparation for Patch 8.1, and our database update would be sorely lacking without their expertise and hard work. Thank you, again! Lili, this process seems to work to travel there for Horde. Of course, after your first run, you can just teleport there directly. I just battled Zujai with a level 16 pet, and it only received 193 xp! With trainers nerfed this severely, what is Blizzard's intention for leveling pets? Not sure why but the starter quests for pet battle is available from Audrey Burnhep could be to do with the problems? @Lili Horde can go to Orgimmar and take the zeppelin to Grom'gol Base Camp in Northern Stranglethorn. Use the teleporter there to enter Gnomeregan. Once inside the dungeon, create a group in the dungeon finder then leave the group. After a minute you will be teleported just outside of the dungeon and directly in front of the quest giver. Did the Interdimensional Pet Portal make it into 8.1? I desperately need space for new pets but I can't find a vendor that sells it.